From the former Mayor of New York trying (unsuccessfully) to ban the sale of oversized sodas to the Australian health campaign ‘Rethink Sugary Drink’, soft drinks may not be to the taste of the world’s government authorities, but they remain extremely popular among ordinary citizens. Take the people of Australia, New Zealand and Indonesia, for example: millions of whom consume at least one soft drink in an average seven days. While the markets in these three Asia-Pacific nations are obviously very different, the latest findings from Roy Morgan Research, taken from more than 50,000 respondent interviews, reveal that they also share a key trait: Cola beverages feature heavily among the most popular soft drinks in each country. 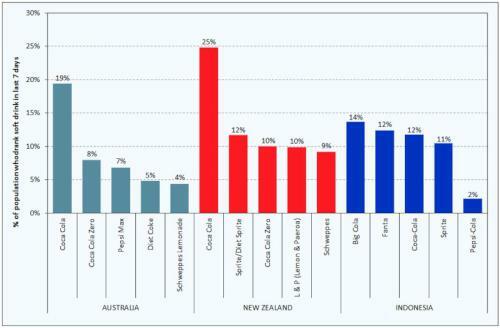 Coca Cola is undisputed leader in Australia and New Zealand, and Big Cola tops the list in Indonesia. No less than four of the five most popular soft drinks in Australia are cola flavoured, and three of those are Coca-Cola brands: Coca Cola (consumed by 19% by Australians 14+ in an average seven days); Coca Cola Zero (8%) and Diet Coke (5%). The other cola brand in the Top Five is Pepsi Max, drunk by 7% of the population in any given seven days. In New Zealand, one-quarter of the population drink Coca Cola in an average seven days, more than twice the amount who consume the second-most popular brand, Sprite (12%). Coca Cola Zero (10%) is in third position, but local brand Lemon & Paeroa (also known as L&P) is snapping at its heels. Big Cola is Indonesia’s most popular soft drink, consumed by 14% of the population (or 21,480,000 people) in an average seven-day period. However, its lead is not as emphatic as that of Coca Cola in Australia and New Zealand. Second favourite, Fanta, is drunk by just over 12% of Indonesians, while the third-most popular brand, Coca Cola, is enjoyed by a fraction less than 12% (still around 20 million Indonesians). “Despite ongoing debate about their lack of nutritional value, soft drinks continue to be enjoyed by millions upon millions of people around the world. Across Australia, Indonesia and New Zealand, cola-flavoured drinks are especially popular. “The leading soft drink in the Antipodes, Coca Cola is consumed by 3,745,000 Australians and 898,000 Kiwis in any given seven days, with other Coke sub-brands also among the top five soft drinks in each country. Meanwhile, Peruvian brand Big Cola reigns supreme in Indonesia, being consumed by almost as many people as the total population of Australia in an average seven days. “The popularity of Fanta in Indonesia highlights how different these three markets are, notwithstanding their mutual love of cola. In Australia, Fanta only just scrapes into the Top 10, being placed ninth. In New Zealand, it is the eighth-most popular soft drink. View this release in full on our website. A full service research organisation specialising in omnibus and syndicated data, Roy Morgan Research has over 70 years' experience in collecting objective, independent information on consumers. 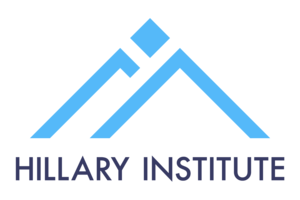 Roy Morgan Research was set up in New Zealand in the 1990s and has been collecting information across a wide range of industries in New Zealand ever since. Roy Morgan currently has over 10 years of trended data on a geographically and demographically representative sample of over 12,000 New Zealanders aged 14+.